Tropical conditions this year at the Nitrolympx, just like at the last race, but most the racers and teams had already adapted to it, after a long heatwave in the whole of Europe. It was 39 degrees Celsius on thursday afternoon under Schleichert's awning in the pits. 0nly the technical inspection was planned for that day. All seventeen bikes passed scrutineering, and by doing so, Joerg Lymant had gather enough point to be absolutely certain of winning this year's championship. That did not stop Lymant's ambition for the rest of the weekend, but he realized it would be very tough for him to win his fifth race in a row. It had taken Frederik Schack (picture above) and his team a bit longer then expected to get the bike in top condition this season, but after testing at Malmö, they were ready for the two final races, the NOX and Mosten, the most prestigious events of the Euroserie. The battle for the second place is a hard one. Buehler, Malmberg, Menzi and Jolink could still grab it. Anders Jensen's bike is making serious power this season, and Anders could also move up a few places in the ranking, with many points at stake in a sixteen-field race. First qualifying round was held at 10:15, more or less ideal, the Hockenheim-ring had not turned into a baking oven yet. Superpro ET and a few other car classes had already run and gave an indication of the track conditions. Olaf Menzi (above) appeared very focused, looking like he was ready to kill, while he was towed along the curbstones into the line-up. His Hungarian/Swiss crew of helpers did a good job, it all worked out great for Menzi. Janek Severa was first in line on the Suzuki that was previously used by Patrick Kras and Yvana and Tonny van den Berg. Janek (above) came close to a "nine" with 10.04 seconds. In the left lane Gerd Caspari did 8.6 on his Sportster powered Alu-Buell. In the other lane, Cord Albers put the first "Seven" on the clock. But he shut off early, confused about where the finish line was, while the Topfuel Dragsters only race 1000 foot. Andreas Herr (below) was given two attemps but failed qualify in the first round. A great Launch for Peter Niklas (below) on the Turbo-Honda, but problems after that, and a 9.92. In the other lane, Olaf Menzi reacted 0.031 seconds, and had wild ride untill he shut off at 1000foot. A new personal best of 7.85 was the result, and qualified #2 after round #1. Olaf was happy, but eager for more. Martin Buehler (below) and his team had already raced at the "Public Race Day" the weekend before, but had made just one pass there, and then had gone back to Switserland to repair the damage. I had never seen Martin Buehler make a wheelie at the launch, but it happened on friday morning. Then 8.8 seconds on the score board. Frederik Schack (below) launched in his usual style, in his first run, but then shut off early after suffering wheelspin at the second half of the track. 10.11 seconds, and at place # 11. In the other lane Dirk Waterschoot, who turned a Rotax-powered Buell into a dragbike last winter, an it's still being developed. Dirk was active in the French championship earlier this season. His first attempt took eleven seconds. Next pair: Sven-Ole Schleichert in the right lane on the V-rod Destroyer, against Jan Malmberg from Sweden. Watching Sven Ole's burnout with his hands on his back in the picture above is Topgas racer Chris van Nimmen. 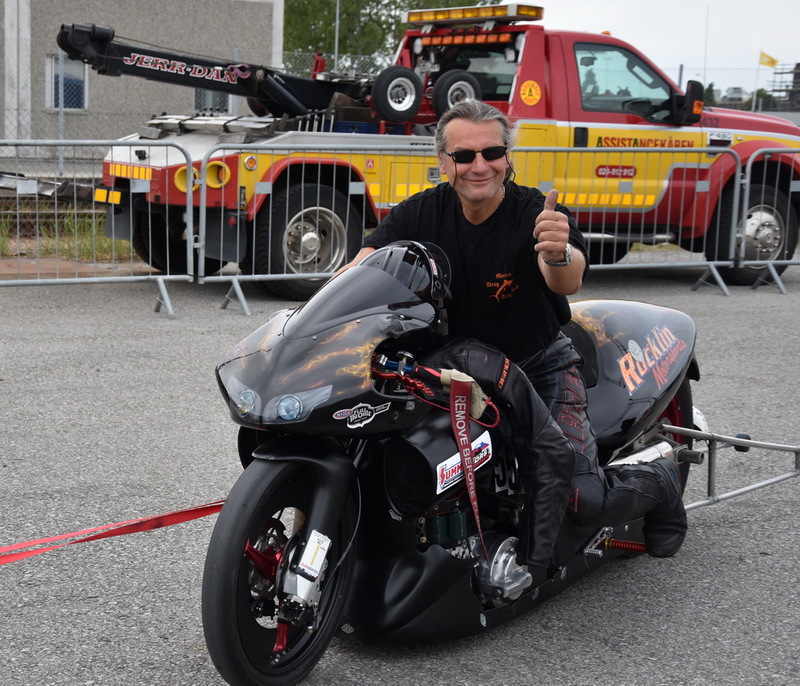 Chris has other obligations an is in a "sabbatical year", but that did not stop him from coming to Hockenheim and giving Schleichert some valuable tips, as Chris has been racing on a V-rod Destroyer himself. Schleichert's first attempt lasted 10.3 seconds. 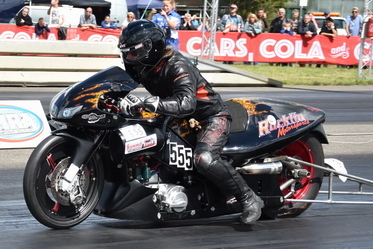 Malmberg's supercharged bike is the quickest Topgas dragbike ever in Europe that is not powered by an S&S G2 engine. Jan set another personal best earlier this season at Hoskovice, Cz, while the weather was cold. Tropical conditions are not ideal in combination with the two blowers on Malmberg's bike. It was fourty minutes past ten when Jan Malmberg ran 8.045, and the place was starting to heat up. Krueger vs. Krueger in the next pair. Tim Krueger on the Rotax-Buell, and Maik Krueger on the V-rod Destroyer. Tim beat Maik, both on reaction and E.T. and the two brothers are on place #14 and 15 after after the first round. Herman Jolink (below) opened with 8.7, not bad, he often improves during a race, but he had already swapped his watercooled Ducati engines twice this season, as he has two of them. In the other lane it should have been Bernd Foit, but he could not get his engine started and took it back to the pits. Then Joerg Lymant was introduced to the audience as the new 2018 champion of Supertwin Topgas by the very knowledgeable and informative speaker Bennie Vos. Lytmant could not beat the times of Albers and Menzi, but he managed to stay ahead of Malmberg's time, good for place #3 on the list. The second session was planned for the afternoon, but postponed to the end of the day because of oil-downs and track cleaning combined with FIA and FIM priority. The dark clouds that moved in seemed to just pass the motodrome, but half way in the session of the Topgassers, big raindrops came down so racing got stopped, and they called it a day. The session was incomplete, so declared invalid. Too bad for Olaf Menzi (above) who had just run 7.80, another personal best. Too bad for Schack and Dirk Waterschoot who also had improved their time. And for Andreas Herr as he manged to make a pass. Peter Niklas and Christian Bruhn had found damage to a valve after round one, had repaired, but were not certian it would hold. It did not. On saturday the Supertwin Topgas class was tree times on the original time plan for that day, but all racers and teams were well aware this could be their last shot at it, when they lined up at 10:15 on that morning. Schleichert And Albers were first in line, but they could not improve. Neither could Severa and Buehler. Optimisme at team Sweden, after Jan Malmberg (above) ran 7.98. A small improvement in time, but in the "seven second zone"! Jan was quickest of the non-G2's after two cool session, but in the afternoon it would be much hotter! In the other lane, Herman Jolink could not improve and dropped to place #8. Meanwhile, in the other lane, Frederik Schack did 7.5 seconds in a great run and became the top qualifier that morning. Team Schack was very happy. Gerd Caspari (below) improved to an 8.5 but stayed at place #7. And in the other lane, Mike Kruger improved his time, and moved up to place #13. The team of Menzi stayed in the pits, working on the brakes, while Olaf went to watch the action (You can see him in the top left corner of the above picture). Joerg Lymant picked up steam, he did 7.65 and moved up to place #2. Dirk Waterschoot was first in line in the third round, at a quarter to three on saturday afternoon. And Dirk did 0.002 beter then he did before. In the other lane Andreas Herr did not improve. Mike and Tim Krueger raced each other again. Below is a picture of Maik. Neither of them improved. Tim stayed at place # 16, Maik got pushed down to #14, and Waterschoot is in between them. Sven-Ole Schleichert (left lane, below) passed Maik Krueger and Janek Severa and moved up to place #12 after doing 10.022. And in the rightlane Buehler went 8.789, an improvement but not enough to pass Herman Jolink, whom he would meet in the 1/8th finals, the next day. Caspari (below, left lane) went 8.499 and stayed at place #7. Olaf Menzi (above, right lane) suffered from a problem with an electrical switch during his run, did not improve, but found the problem and was able to repair the switch, later that day. It was the last chance for Bernd Foit (below) to set a time and get on the list. His launch looked good! But he blew it by leaving the startline before the timing was activated. 7.72 seconds for Cord Albers (below, right lane) in the next pair, while holding nn the the #3 spot. The engine seems to work fine, now the clutch gets all the attention of Anders, Michael and Tom. Peter Niklas had damaged his engine again during the cancelled round on friday, this time beyond repair, and did he not race on saturday. Another round of qualifications was planned, but while FIA- and FIM-classes needed more time then expected, it became obvious that the fourth session for Topgas would be cancelled. And it was no supprise when that message came. The Funny Bike class also was a victim of it. The result after the quailifications: Sixteen racers qualified, with no alternates. Peter Niklas' bike was broken and Anders Jensen would get a bye-run because of that. Frederik Schack won in the 1/8 finals with 9.6. Not impressive, but quick enough to stay ahead of, and beat Tim Krueger. Second pair: 8.74 seconds for Buehler, his best time so far, while beating Herman Jolink. Jolink (above, right lane) had a the better reaction, 0.018, but Martin went to get him while Herman was slowing down at the end. A very close, Buehler passed the finish 0.024 seconds before Jolink did. A new personal best of 9.81 for Janek Severa in the next pair. Janek (left lane, above) got eliminated by Olaf Menzi who ran 9.2 and shut off early. Janek went quicker then the previous racer of the bike, Tonnie van den Berg, who did 9.949 on it at Drachten in 2016. Jan Malmberg gave Sven Ole Schleichert a head start of about 0.4 seconds, as you can see on the picture below. Malmberg had already closed the gap at the 60-foot mark and won with an 8.1, while Schleicher did a poor 11.5. A very sharp reaction by Gerd Caspari (below, foreground) of 0.006 seconds, way before Andreas Herr made a move. In fact, Andreas did not move much, while his bike was smoking heavily. Herr did not make it to the finish line. A consistent run for Gerd, another 8.5. A poor reaction time of 0.61 seconds by Maik Krueger, and even worst by Cord Albers: 0.72! Albers (above, foreground) put the first "seven" of the day on the scoreboard and beat Krueger in 7.87. Then Champion Joerg Lymant (below, left lane) stopped the clock at 7.54 doing 280 kmh. No chance for Dirk Waterschoot (10.4 @ 207). Speaker Bennie Vos explained to the spectators that Anders Jensen would probably take it easy during his bye-run, as he saw Jensen pass the waterbox without doing a burn-out and move forward towards the start line. Still some photographers pointed their camera's at him, expecting to see fireworks. Jensen used the oportunity to test his clutch in a mild launch, and shut off after about ten meters. Herman Jolink and his helpers Urs and Kevin started swapping the Ducati engines as part of the preparation for the next race, while the winners of the first round prepaired for their quarter finals. Martin Buehler produced an exact copy of his previous run in the quarter finals, but this time it was not enough to advance to the next round. Frederik Schack (foreground) eliminated Martin Buehler in 7.59 seconds. Jan Malmberg and Olaf Menzi, two contenders for place #2 in the championship, had just seen their major opponent (Buehler) get eliminated when they raced against each other. Malmberg (below, foreground) seemed narcoleptic at the startline again, more then half a second had passed before Jan reacted. Then a disappointing 10.6 sec. In the other lane Olaf Menzi did the best time of all Topgassers so far, a fat new personal best of 7.486 seconds in a great run. And Olaf also won lane choice in for the next round, against Schack. Another 7.4 in the next pair, and another new personal best. Well done Joerg Lymant! 7.498, not as quick as Menzi, but 10 kmh faster... Lymant's opponent Caspari had already eliminated himself by redlighting. Cord Albers (above, foreground) was not able to produce his usual "seven" but he reacted better then Anders Jensen who's bike lacked power, so Cord advanced to the semi finals to meet Lymant. Olaf Menzi caused another upset, but this time in a negative way, he let his engine die during the burn-out of the semi finals, and a re-start is not allowed in Topgas in the eliminations. (it is allowed in prostock bike, btw). So Frederik Schack (above) had a free ride into the finals. But he did not take it easy, as lane choise in the finals was at stake. Frederik ran 7.53, his best time so far this weekend. Joerg Lymant (above, foreground) beat Cord Albers in 7.55 vs. 7.95, so the lanechoice for the finals was won by Frederik Schack with a very tiny difference. Everybody expected fireworks in the finals, and that's what they got! Schack reacted better, and was leading all the way. Lymant lost 0.09 seconds to Schack at the startline, but only 0.05 was left of it at the finish. A great new personal best for Joerg Lymant of 7.490 while doing 288 KMH. Great racing, a fantastic final pair! A high speed accident by Rikard Gustafsson put a damper on the great race this year. Hopefully he gets well soon! Many thanks to Jerry Lackey, Ian Marshall, Peter Marz and all the others at the Nitrolympx. See you all next year. Joerg Lymant is the champion of 2018. Jan Malmberg is at place #3 in the point list, Olaf Menzi is just 5 points behind Malmberg on place #4. (1255 points for Janne, 1250 for Menzi). Buehler has 1340 points, but he was at all races, and needs to skip one round, as the best five results count. His worst result so far is 140, so if he does well at Mosten, it's 1200 plus the points he'll pick up at the final race of the season, that will count for him. So, in theory, Janne and Olaf are 55 and 50 points ahead of Martin. Jolink has 1110 points and already skipped one race. So he's less then one round behind Buehler. Peter Niklas has 950 but needs to skip one (100 points), and Jensen collected 940 and already skipped. Schack is at 880 points after winning Hockenheim, and could easily move up a few places in the ranking after Mosten. Olaf Menzi did a big fat personal best at Hockenheim last weekend and he could surprise everybody again at Mosten and become the runner-up for 2018. So it's going to be exciting at the last race of the season!